1) Investing in equipment for community farms staffed by experts. 2) Teaching farmers yield-enhancing farming techniques. 3) Buying organic produce directly from the farmers. 4) Selling the food to consumers. GreenPath Food works with East African smallholder farmers on high-yield and environmentally friendly agricultural techniques, in order to bring their specialized organic produce to international markets. Smallholder farmers represent a currently untapped opportunity to meet the growing global food demand. 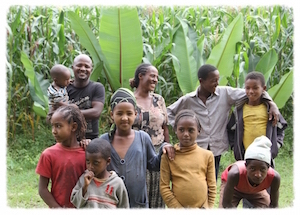 GreenPath empowers partner farmers in transitioning them to techniques that increase yield. GreenPath is committed to only growing sustainable, healthy and nutritious food. They train their partner farmers on organic, bio-diverse techniques that eliminate the use of non-renewables, like chemical fertilizer. GreenPath seeks to increase their partner farmers' yields for fruits and vegetables by using organic, bio-diverse and sustainable farming practices. Increased fruit and vegetable yields will lead to higher incomes, and incentivize farmers to move away from growing less nutritious crops, like wheat or maize. With more nutritious foods on their farms, farmers will eat healthier foods at home. Need help finding solutions that respond to your unique development challenges? Apply through our Project Accelerator service or Contact us directly for needs-based project consulting. TEL is a registered non-proﬁt, tax-exempt charity under section 501(c)(3) of the U.S. Internal Revenue Code. Donations are tax deductible to the extent allowed by U.S. law. TEL is a public resource with no commercial allegiance.